Delvena Doris (Rohrbaugh) Phares, age 72, of Maysville, WV passed away on Monday, May 14, 2018, a result of an automobile accident. She was born July 26, 1945 in Maysville, WV and was a daughter of the late Otha Lark Rohrbaugh and Dorothy Mae (Reel) Rohrbaugh. In addition to her parents, she was preceded in death by her husband of 53 years, Michael Otis Phares on August 28, 2016; her infant brother, Otha Lark Rohrbaugh, Jr.; her sister, Linda Rohrbaugh and brother-in-law, Harold "Muggs" Hedrick. Delvena graduated from Petersburg High School in 1964. In 2010 she retired from the West Virginia Department of Highways after 30 years. 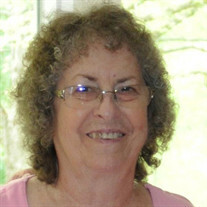 She was a member of the former Maysville Gospel Tabernacle and currently attended the Maysville Bible Brethren Church. Delvena is survived by two daughters, Jeannette (Clem) Roby of Petersburg, WV and Sherry (Michael) Orndorff of Harrisonburg, VA; three grandchildren, Jeremiah Mark Berg, Autumn Noel Orndorff and Burgundy Elizabeth Roby; three sisters, Carolene (Larmer) Davey of Maysville, WV. Fran Hedrick (Mike Hipp) of Maysville, WV and Diana Sue (Steve) Vance of Petersburg, WV. One brother, Larry (Rhonda) Rohrbaugh of Dorcas, WV and several nieces and nephews. Family will receive friends on Thursday, May 17, 2018 from 4 - 7 p.m. at the Schaeffer Funeral Home, Petersburg, WV. A Memorial Service will follow at 7 p.m. at the Schaeffer Funeral Home with Pastor Lynn Durbin officiating. Burial was private in the Maysville Cemetery. The family suggests that memorials may be made to the Maysville Bible Brethren Church, P.O. Box 213, Maysville, WV 26833 or Charity of Choice.